Pan, Gary; Hackney, Ray; Panc, Shan L.: Information Systems implementation failure – Insights from prism; in: International Journal of Information Management, Vol. 28 (2008), pp. 259269. The authors apply a „antecedents  critical events  outcomes“-framework to analyse the implementation process. Pan et al. 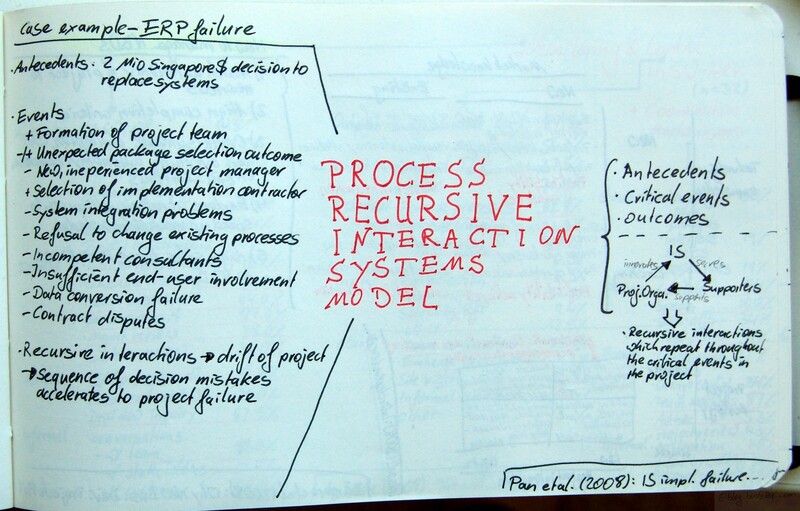 postulate a recursive process interaction model which repeats throughout critical events in the project. The Process modell flows circular between Project Organisation-(innovates)-IS-(serves)-Supporters-(support)-Project Organisation and so on. Furthermore the authors identify critical events (positive and negative) to analyse the system failure of the whole project. Generalizing from the chain of negative events, Pan et al. found that recursive interactions lead to a drift of the project. Subsequently that drift leads to a sequence of decision mistakes which accelerated into project failure. This entry was posted on Donnerstag, September 18th, 2008 at 08:45 and is filed under Critical Incident Technique, Decision Making, Failed Projects, IT Project. You can follow any responses to this entry through the RSS 2.0 feed. You can leave a response, or trackback from your own site.